Successful ownership of a pet is all about paying attention to the details, whether you own a dog or a lizard, such as a bearded dragon (reptile of the genus Pogona). When you examine your bearded dragon to ensure that things are in fine working order, make a point to look at everything from the alertness of his eyes to the coloring of his tongue. Irregularities with these items sometimes denote health woes. Bearded dragons' tongues, for the most part, are vivid red and pink in coloring, in varying degrees of lightness and darkness. The interiors of their throats also usually are similar in color -- a form of pale pink. As far as actual throat color goes, some types of bearded dragons differ noticeably. Some species have throats that are closer to orange or yellow than pink, possibly for purposes of differentiating between the sexes. Rankin's dragons (Pogona henrylawsoni) are one such example. If just the tip of your bearded dragon's tongue looks conspicuously white, he's not unusual. These parts of their tongues not only tend to be lighter, they also tend to have a gooey texture, which is a convenient physical adaptation that enables these lizards to seize prey more easily and quickly. These tips sometimes are white, and they're sometimes simply a lighter shade of pink. Although white tips of tongues are normal and commonplace in bearded dragons, overall paleness of the mouth sometimes is cause for concern. If your beardie's throat and tongue look white or noticeably pale, it actually could indicate a health problem, so take notice. These symptoms potentially could signify anemia, parasites or possibly even other ailments. Contact a reptile veterinarian immediately if you observe any abnormal coloration in your bearded dragon's tongue or mouth. 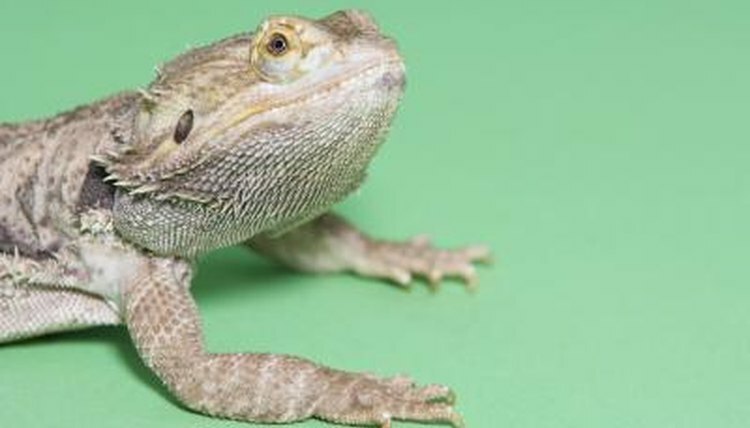 A variety of other conditions can signify health issues in bearded dragons apart from mouth coloring. Loose and runny stools are problematic, for one. Other concerns include zero interest in eating meals, lackluster eyes, eye discharge and creases in the skin. If a bearded dragon seems exhausted, sluggish, lazy and devoid of energy in general, it often means that he's under the weather due to sickness. If you ever pick up on anything abnormal in your lizard's appearance or behavior, waste no time in getting him an appointment with the veterinarian. Some kinds of ailments that are prevalent in the bearded dragon world include metabolic bone disease, respiratory infections and parasites. Whether or not you see any unusual signs in your lizard, make sure that he always visits the veterinarian a minimum of once per year.